Hardly any traveller leaves Tokyo unimpressed. The simple reason? 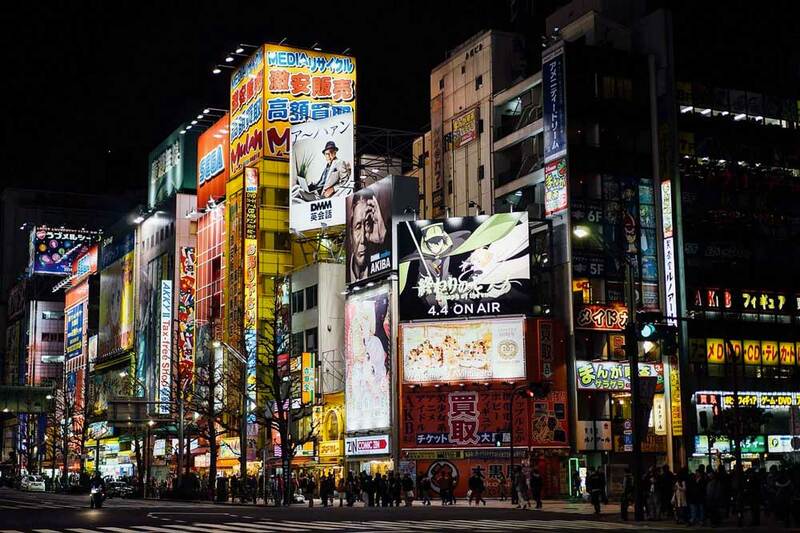 Tokyo is electric, and few world cities immediately grasp your attention the way it can. But with its mammoth size comes the great dilemma: How do you pinpoint what to do in Tokyo? 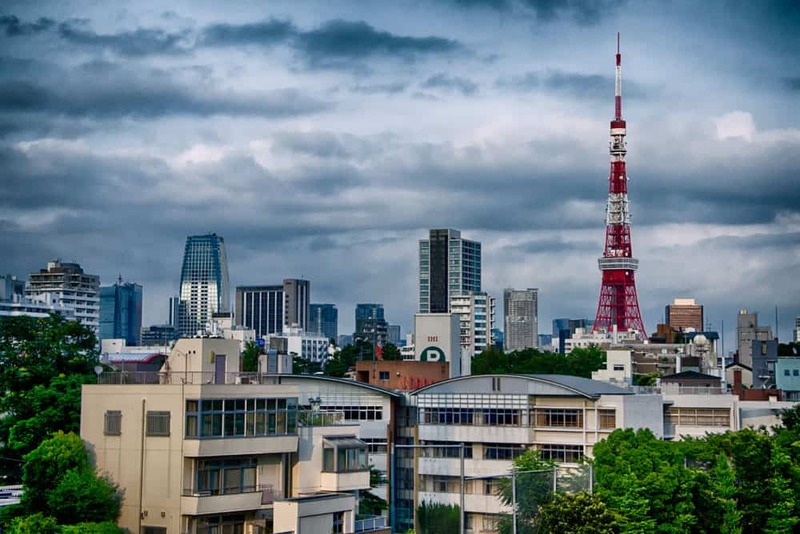 This guide to best things to do in Tokyo will help tackle that all-important question. 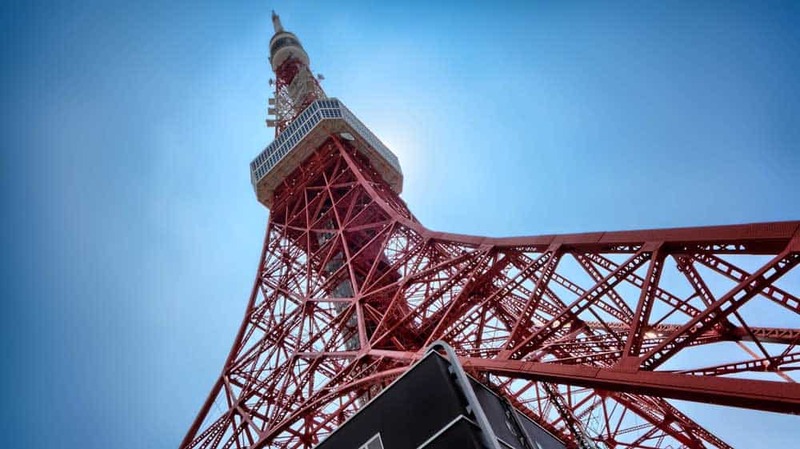 I’ve included practical information wherever possible to help you navigate this exciting city without much fuss, putting all the top Tokyo attractions at your fingertips. Let’s explore Tokyo! Picking out the best things to do in Tokyo is never an easy task. With the size of Tokyo alone, you could almost spend your entire trip to Japan in the city without seeing the same street twice. Add in all the awesome day trips from Tokyo, and it’s obvious why the capital is the perfect introduction to Japan! Fortunately, public transportation in Tokyo is top-notch. Getting around the city is an absolute breeze (as long as you avoid rush hour); most of the best Tokyo attractions are just a quick train ride away! So, visiting a fish market probably isn’t on top of your bucket list. The smells are off-putting, the whole scene a little grotesque at times. But there’s no doubt that an early morning jaunt to the tuna auction at Tsukiji Fish Market should be high on your “what to do in Tokyo” list. Get a one-up on the sun, launching your trip to Tsukiji Fish Market in the pre-dawn hours. Only 120 visitors are permitted into the tuna auction per day with no advance reservations possible. Registrations start at 5am, but to claim your spot among the hordes of tourists, you’ll need to snag your spot in line earlier. Sometimes much, much earlier! Two groups of 60 visitors launch into the tuna auction at 5:25am and 5:50am. Watch the fascinating scene unfold as human-sized tuna are inspected and sold off the high bidders. Flash photography isn’t allowed, nor is getting in the way of the vendors. Remember this is a real place of business, not a tourist attraction! If you lack the willpower to leave your cloud-like mattress at such an early hour, you could always skip the tuna auction and visit Tsukiji Market later in the morning. 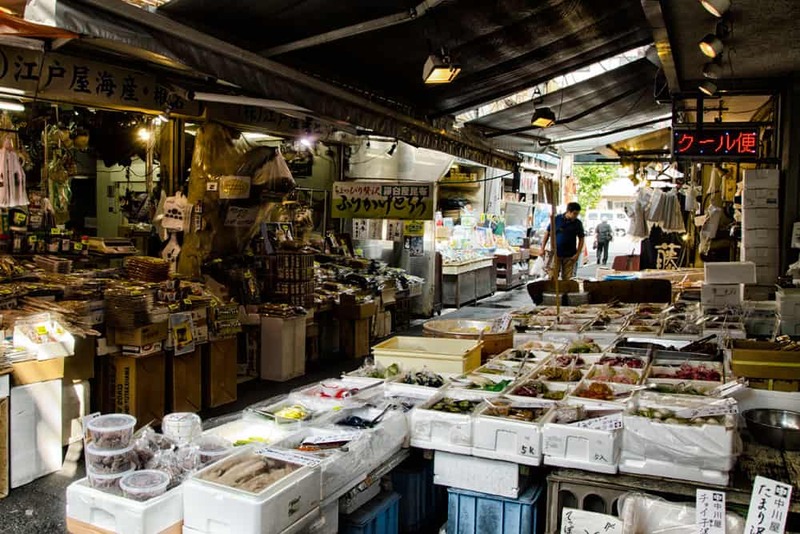 The market stalls and food vendors along the Tsukiji Outer Market are fascinating and warrant a visit on their own! Grab your spot at one of the food stalls for a yummy sushi breakfast that will forever destroy your ability to enjoy sushi anywhere else. The folkloric tales of Japan match up to the ancient streets of Asakusa, Tokyo’s most traditional central district. In a city whose fame emanates from its never-ending, glass-filled skyline and, at times, futuristic glow, Asakusa is a breath of fresh air. The approach in the area begins at the grand Kaminarimon (Kaminari Gate). Over a millennium of history pre-dates the gate, although the current incarnation is a modern-era reconstruction. The gate opens up to Nakamise-dori, a traditional shopping street where you can fill your bags with trinkets and various souvenirs for the folks back home. At the district’s heart rests Senso-ji Temple. 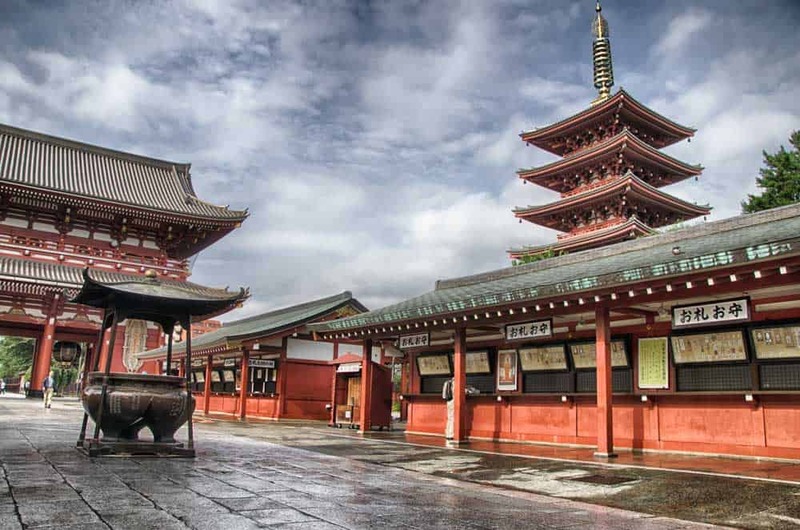 The history of this Buddhist temple, among the most famous temples & shrines in Tokyo, digs back to the 7th century. Even though today’s rebirth is a post-war construction, the grandeur of Sensoji Temple hasn’t been lost. Admission to the temple and its beautiful grounds is free. Besides all the obvious things to do in Asakusa, the district is simply a pleasure to wander around aimlessly. Plenty of traditional Japanese wooden houses, restaurants and shops dot the streets spoking from Asakusa’s centre. Slip into the alleyways and saunter the surrounding blocks to see what you’ll find! To watch Tokyo slow down (a rarity, I know), find your inner peace at Meiji Shrine near Shibuya’s gutsy Harajuku neighbourhood. Unlike some of Tokyo’s other attractions, this lovely place of worship doesn’t have a history reaching back to long bygone centuries. It was originally completed in 1920 in dedication of Emperor Meiji and the Empress Shoken. Fast forward just twenty-some years, World War II handed the shrine a massive strike. What you’ll see here now is, like so many Tokyo points of interest, a post-war reconstruction holding true to the original. 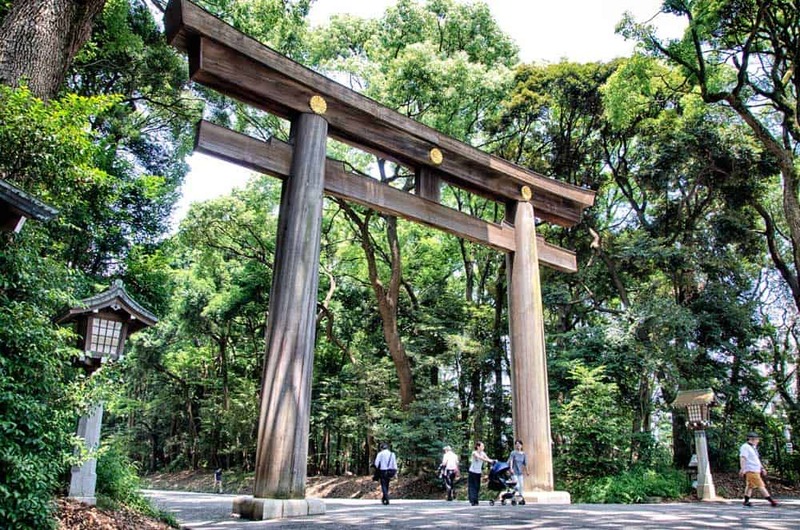 Meiji Shrine shares greenspace with Yoyogi Park, one of the other best things to see & do in Tokyo. The main complex of this Shinto shrine sits in equal distance to both the southern and northern entrances. A large torii (gate) marks the main entrance near Harajuku Station as you escape the bustle of Shibuya for its tranquil wilderness. Once you reach the main complex, there’s a number of interesting buildings to check out. Keep your eyes open for the Treasure House. The treasure house holds a number of important artifacts from the Emperor and Empress. The Inner Garden is also impressive, although you’ll have to shell out a few yen for the pleasure of visiting. While wandering around Harajuku, you’re bound to stumble upon its heart & soul at Takeshita Street (Takeshita-dori). The stretch is famous as the epicentre for Japan’s edgy youth fashion styles. Along it, you’ll get to dodge into everything from from hip fashion boutiques to vintage shops. The avenue is also one of the famous places to eat in Tokyo for street food—especially for its desserts! While visiting, don’t miss a chance to wiggle yourself in among the crowds at one of its popular crepe stands or ice-cream shops. Yumm! While it certainly won’t compete with what you’ll find in Kyoto, Tokyo Imperial Palace unfolds a classic scene that no Tokyo itinerary should skip. Realistically, there isn’t much for visitors to do here without a little pre-planning. The palace is the current residence of the Emperor and Empress; needless to say, you can’t simply show up and expect to walk around unfettered. Tours are available, however, with advanced registration. Book your free 1.25-hour tour on the Imperial Household Agency website or by showing up 30 minutes prior to the tour time—usually 10:00am and 1:30pm (outside summer only), Tuesday to Saturday—at the Kikyo-mon Gate. Even if you missed snagging your spot on a tour, the Outer Garden (Kokyo Gaien), East Garden (Kokyo Higashi Gyoen) and Kitanomaru Park are open to the public. The best view of the whole lot though is in front of Nijubashi, Tokyo’s most famous bridge. 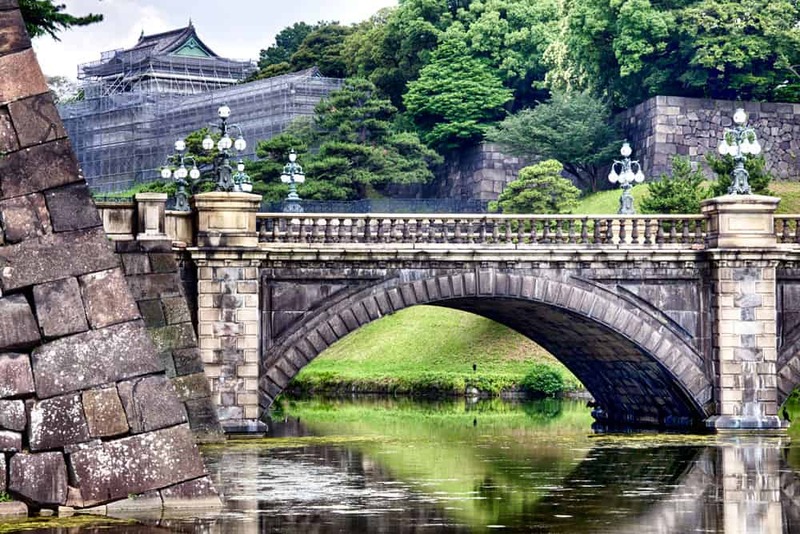 Elbow your way through the permanent crowd of amateur photographers to grab your shot of the stone bridge backdropped by the classically Japanese guard tower in the the inner grounds. 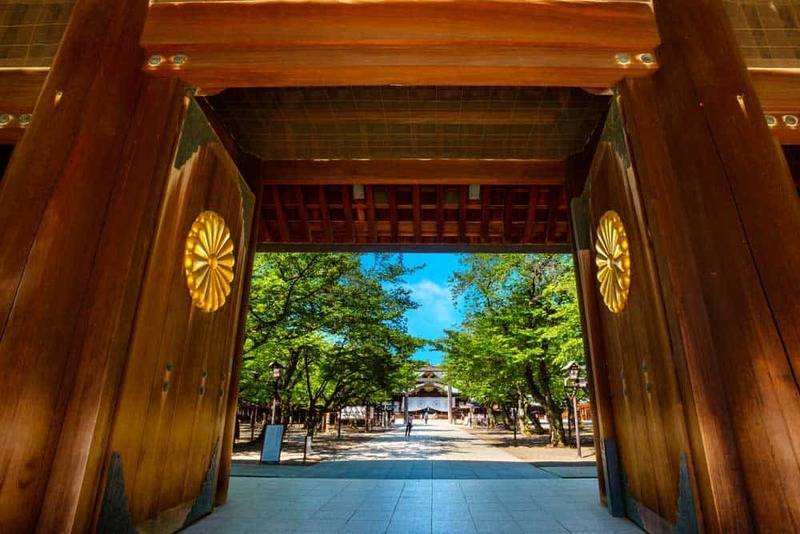 While wandering around Chiyoda, keep on the look out for Yasukuni Shrine, located northwest of the Imperial Palace and Kitanomaru Park. Built in 1869, this Shinto shrine enshrines the spirits of about 2.5 people people who died in the various wars that helped to establish Japan as a modern country. Moving adjacent, history buffs can forge some insight at the Yushukan, a large museum dedicated to Japanese military history. The grounds also teem with hundreds of beautiful cherry trees, including the tree whose first blossoms indicate the official start of sakura season. Hanging out beside Meiji Shrine, Yoyogi Park (Yoyogi Kōen) in Shibuya’s Harajuku neighbourhood is one of the best places to visit in Tokyo to catch a breather. Although not as tranquil as the forests further north, there’s a buzz in the air here that’ll capture your attention as you ditch the busy streets for greener alternatives. The park’s a massively popular hangout for Tokyoites. While you won’t find quite the same level of weirdness here as at one of the infamous Sunday gatherings on nearby Harajuku Bridge, don’t be surprised when you encounter odd characters and entertainers who unwind and practice their skills here. Move to the northern and western fringes of the park for a little more solitude. Art lovers are in heaven when they trot along to Nezu Museum at the end of Omotesando Avenue in the hip Aoyama district. This private art museum, featuring a collection of over 7,000 pieces of pre-modern Japanese & East Asian art, is one of the best of its kind in the country. Even if the art doesn’t turn your crank, the museum is equally famous for its lovely landscaped garden. Stroll through its paths among moss-covered statues, ponds, waterfalls, and gnarled pines. The best season to visit the garden is in autumn when its stunning fall colours are out in full-force. Unlike the more energetic Yoyogi Park, Shinjuku Gyoen National Garden rebalances the chi as Tokyo’s best nature unfolds before your eyes. Strolling through the pathways among the ponds and greenery in this 58-hectare park is the perfect escape from the ever-electric Shinjuku district. Three main gardens—Japanese, French, and English—frame the park. All are impressive, but the Japanese Garden—featuring paths that meander over bridges and around ponds and pavilions—has a truly distinctive Asian feel that captures the imagination. If you’re visiting in late March and April during Tokyo’s cherry blossom season, be sure to scope them out here. Autumn is also a great time to dwell in the park when the leaves take on new hues for a colourful scene. The park is open 9am to 4pm every day except Mondays (and Tuesdays after a national holiday that falls on a Monday). The entrance fee is ¥200. In all my travels, I’ve yet to encounter another place quite like Shibuya. When I dreamt of the streets of Tokyo, flooded with neon and a never-ending stream of passer-bys, Shibuya’s where I first found it. Although it’s is a huge district, Shibuya usually alludes to the shopping and entertainment district centered around Shibuya Station. Much of Tokyo’s edgy fashion sense emanates from the department stores and boutiques around Shibuya. 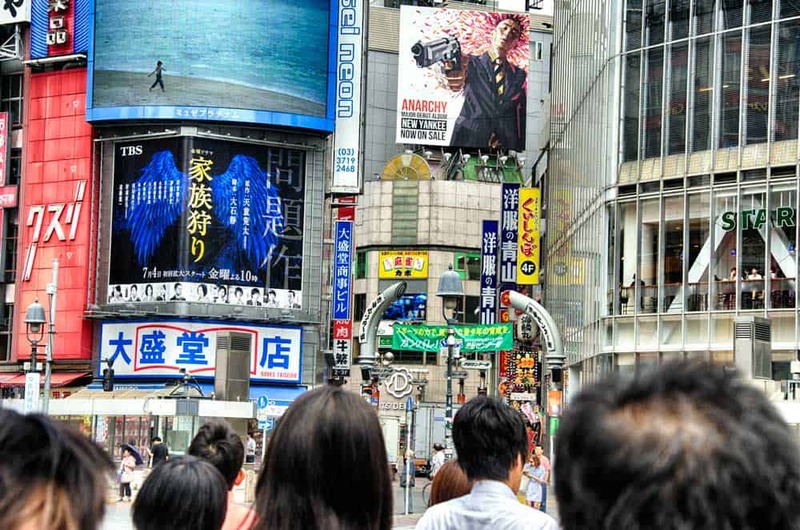 Besides soaking in the epically mammoth city atmosphere (best exemplified at Shibuya Crossing, dubbed as the world’s busiest pedestrian crossing) prepare to unload some yen shopping in the boutiques along Center Gai or in Shibuya 109. The restaurant selection in Shibuya is equally spectacular. Cheaper eateries rub elbows with more upscale sushi restaurants and izakaya, leaving plenty of delicious choices for all budgets for checking off all the must-try Japanese foods. After soaking up everything in Shibuya, treat yourself to bowl of ramen noodles at Ichiran or eat sushi at a standing bar like Uogashi Nihon Ichi. If your dream vacation involves big, sweaty men grappling in skimpy aprons, you’ve come to the right place. Even if not, you’ll still get a kick out of visiting Ryōgoku Kokugikan (Ryogoku Sumo Hall) near the banks of the Sumida River for a taste of Japan’s national sport of sumo wrestling. During national tournaments (January, May and September) over 10,000 spectators pile into Ryōgoku Kokugikan to cheer on their favourite wrestlers. Whether you’re in town to attend the tournament or not, there’s a Sumo Museum in the complex to help you get a better handle on the sport. If you’re interested Tokyo’s earlier history, be sure to stop into the next-door Edo-Tokyo Museum featuring a number of fascinating exhibits that detail the city’s history prior to 1869 up to the modern era. Somehow the true English translation of Omoide Yokocho wasn’t cutting it. For reasons we’d best not bring up, the nostalgically named Memory Alley shaved off its family-friendly handle for the brasher—and, admittedly, more memorable—Piss Alley. No, Omoide Yokocho isn’t deplorable as its nickname would suggest. Actually, exploring it heartily is one of the best things to do in Shinjuku! Dozens of small bars and eateries line this narrow alleyway near Shinjuku Station. A rich history, full of fires and public urination, pre-dates present-day Omoide Yokocho. Things are calmer here now, yet it still maintains that authentic atmosphere that bolstered its popularity. The pleasures here are simple: eat, drink… and enjoy! Looking to stay near Omoide Yokocho? Check out these recommendations for the best hotels in Shinjuku! 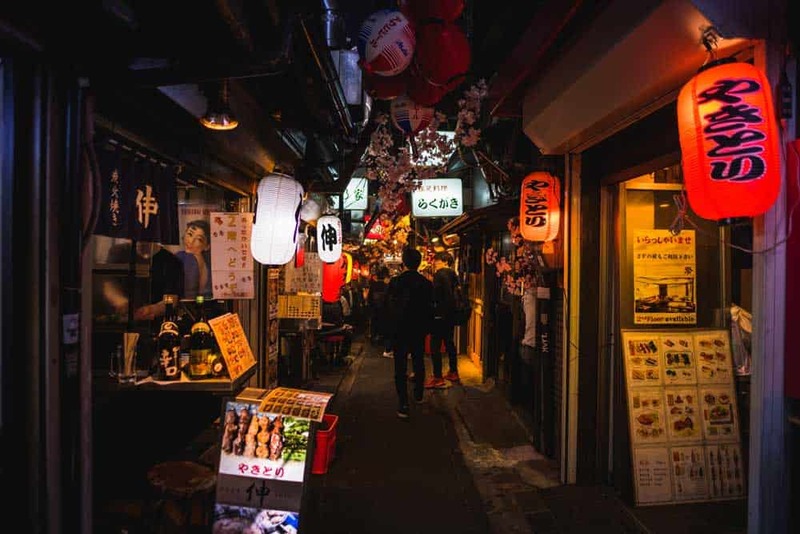 Like Omoide Yokocho, Golden Gai sends travellers spiraling back into Tokyo’s past with its nostalgic collection of small alleyways in the buzzing Kabukicho area of Shinjuku. 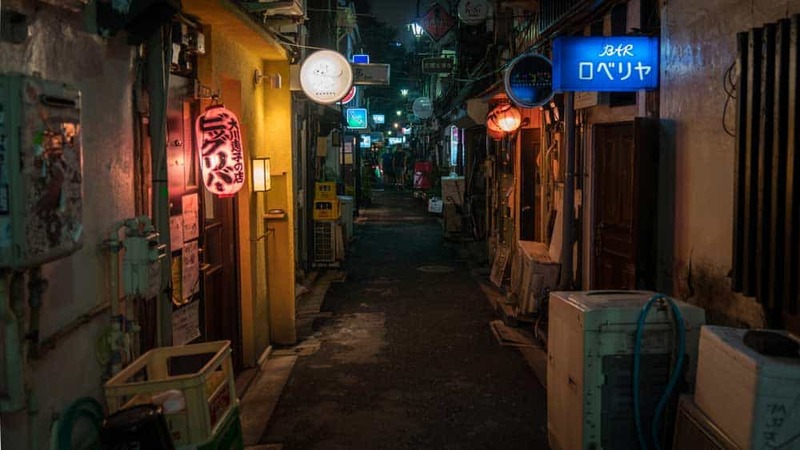 While most of Tokyo was either bombed in World War II or flattened to build its new modern face, Golden Gai was still able to preserve its original looks. In the expanses of its narrow warrens, you’ll stumble across hundreds of pubs & restaurants—some only large enough to fit five patrons! Many of these bars & restaurants aren’t just traditional, but quirky with interesting decor and menus that are anything but ordinary. Although the area is a popular escape for tourists, it’s not known for being overly friendly to foreign visitors. Don’t be offended if you’re refused a seat at one of the local pubs! 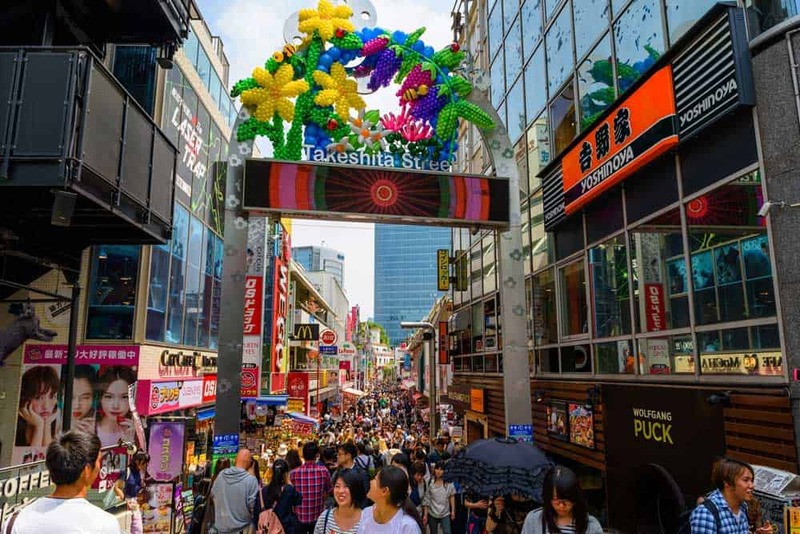 On the other side of town from the chaos of Shinjuku and Shibuya, Yurakucho is another shopping and entertainment district that’s worth digging into while visiting Tokyo. 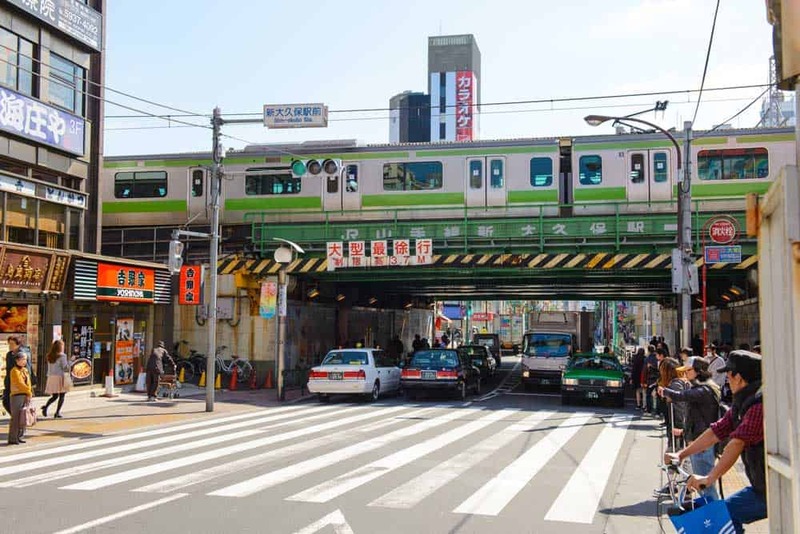 The main stretch of restaurants, clinging below the JR Yamanote Line, are a perpetual favourite among hard-working Tokyoites. Yurakucho is most famous for its izakaya (Japanese pubs) and yakitori joints that hide along the train tracks. Pick one and pop in for one of Tokyo’s must-try dishes and cold beer for an truly authentic experience! Want to stay close to Yurakucho? Check out these recommendations for the best hotels near Tokyo Station! If you can’t slip Seoul into your East Asia travel plans, Shin-Okubo Korean Town in Tokyo might be the next best thing. A good chunk of the the 80 thousand or so Koreans in the city call this eclectic neighbourhood, to the north of Kabuchiko in Shinjuku, home. Although Korean restaurants are popping up all over the capital, Shin-Okubo offers some of the best Korean food in the city. Follow your nose to one of the delicious Korean barbecue joints along Okubo-dori, the main drag in Shin-Okubo, to tackle your appetite. Keep your ears perked up for the sounds of K-Pop inviting you into one of the many Korean shops in Shin-Okubo for a cultural experience that can only be described as odd. You might be scratching your head asking how in the world a stadium cracks a list of the top activities in Tokyo. 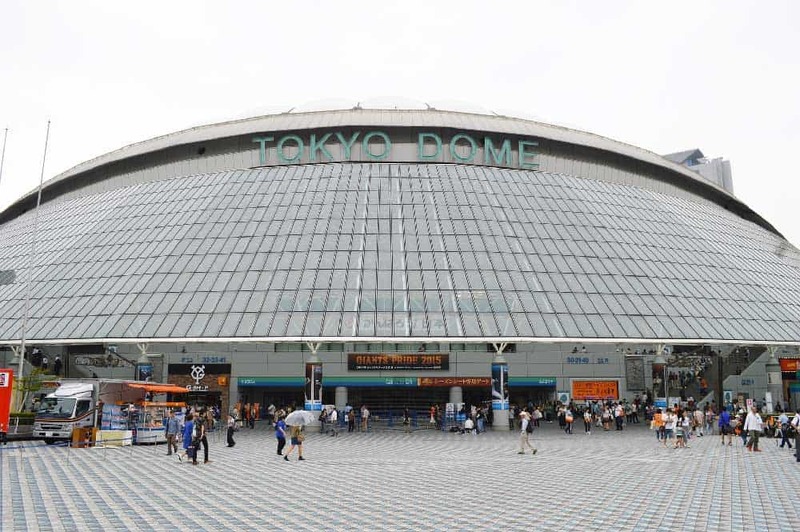 Although Tokyo Dome is most famous for being the home of the insanely popular Yomiuri Giants baseball team, this complex is much more than a simple sports venue! The area around the stadium features everything from a hot springs resort (LaQua) and multimedia space museum (TenQ) to an indoor sports park and a FREE amusement park famous for the Thunder Dolphin, the fastest rollercoaster in the city. If you get a chance, catch a baseball game or concert followed by a shopping spree, onsen soak or an adrenaline-pumping ride. Paris has the Eiffel Tower; Japan’s capital has Tokyo Tower. The similarity between two of the most famous landmark towers in the world isn’t accidental. Like so many towers around the world, the architects of the tower used the City of Lights’ star as its inspiration—and then surpassed it by stretching 13 metres higher! While no longer the tallest structure in Japan (it’s the Tokyo Skytree now), Tokyo Tower offers some of the best vistas of the cityscape—even with its distinctive red girders missing from view. The main observatory, soaring in at a height of 150-metres, costs 900¥. There’s also an even higher special observatory, enhancing your views with an extra 100 metres in height. Fascinated with Tokyo’s modern side? Carve out a little time to visit Roppongi Hills, one of the Japanese capital’s most ambitious urban development projects. Located in Minato just south of the upscale Akasaka district, Roppongi spins together a mishmash of offices, apartments, restaurants, bars, museums, and shops, sparked by area’s growing high-tech industry. Mori Tower: A 238-metre-high 54-storey tower that’s one of the city’s tallest buildings. The tower hosts a barrage of shops, restaurants and offices along with a few goodies that’ll appeal to travellers. Tokyo City View: An incredible observation deck located atop Mori Tower. The floor to ceiling windows unleash epic 360-degree views over the skyline. Mori Art Museum: Another great place to visit in Mori Tower, this museum showcases modern art exhibitions from both Japanese & international arts. Even non-art-lovers will love the unpretentious nature of Mori Art Museum over other stuffier galleries around the world. Mori Garden: A beautifully landscaped Japanese garden stuffed between modern buildings. Visit during cherry blossom season to catch Mori Garden at its finest. Is there any better place to spend an evening in Tokyo than Odaiba? Perhaps not. This impeccably developed waterfront district, situated on a man-made island on Tokyo Bay, is a premier sunset-watching destination and a great place to chow down or fill your shopping bags. The evening and nighttime views from Odaiba over the horizon are simply magnificent. Framed by Tokyo’s famous Rainbow Bridge, the vistas you’ll soak in while trotting along the waterfront sit among the most classic captures of the city’s skyline. Even during the day, there’s a ton of things to do in Odaiba. The area is a full-fledged shopping and dining district with options to suit every taste. Relieve your wallet of some yen at Aquacity Odaiba or Decks Tokyo Beach, two of the areas best shopping malls. Kids (and adults!) 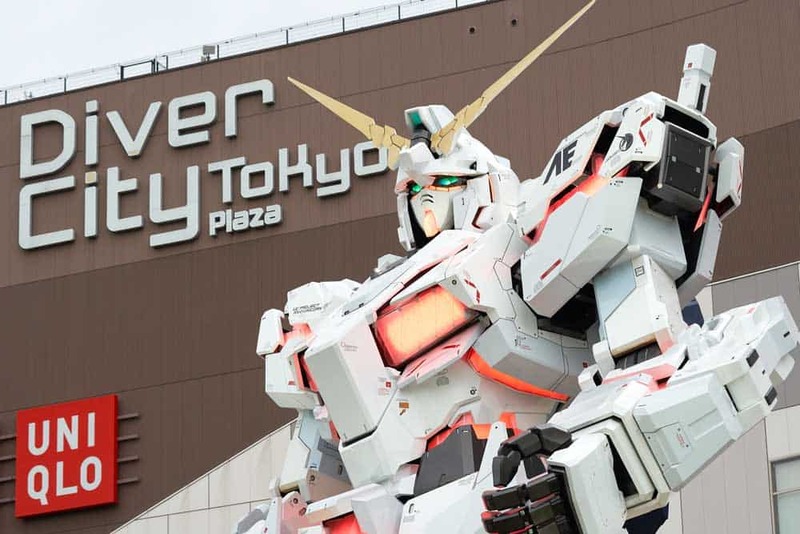 will love the enormous Transformer-like Gundam statue in front of DiverCity Tokyo Plaza. 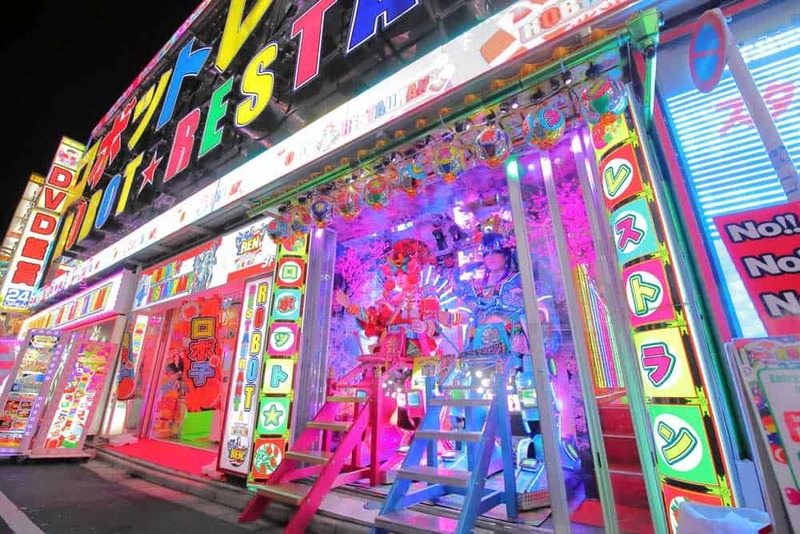 If you thought the stationary Gundam statue in Odaiba was cool, you’re in for a real treat if you visit the Robot Restaurant in the Kabukicho entertainment district. As weird & wacky as this place is, there’s hardly a visitor—whether they loved or hated it—who’d say it’s not an essential experience to have while visiting Tokyo. Watch in amazement as the world’s undoubtedly strangest cabaret show unfolds. It’s loud & obnoxious, full of brightly-coloured flashing lights, dinosaurs, samurai, ninjas, panda bears, and, naturally, gigantic robots. In short, it might just be the most ridiculous and over-the-top entertainment you’ll ever catch anywhere on earth! Of course, this whacked-out restaurant is immensely popular among visitors. Be sure to book your tickets online before arriving to save time & money and ensure your spot in the madness. 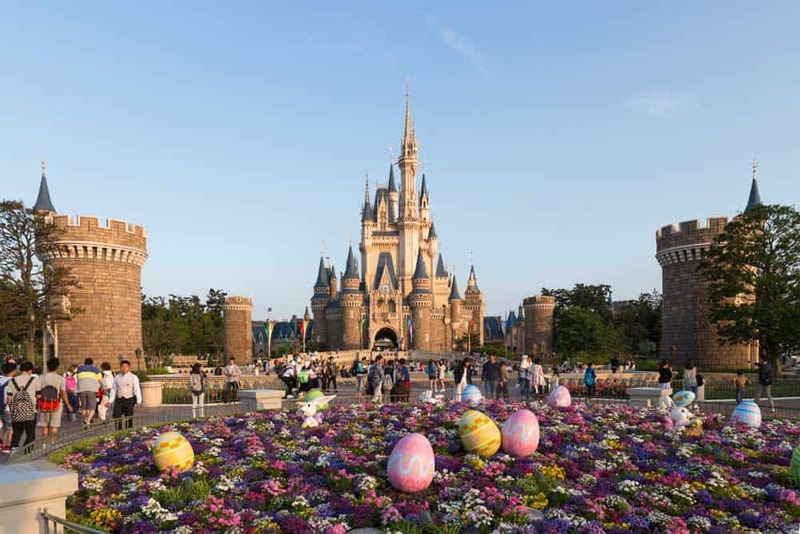 If you’re travelling to Tokyo with kids, there’s no escaping spending time at Tokyo Disney Resort. This massive resort, tethered to the edge of Tokyo Bay, is home to two separate theme parks, hotels and a shopping mall. World Bazaar: A covered shopping arcade designed to resemble an American downtown in the early-20th century. Tomorrowland: An area focusing on space & futuristic themes. Includes the popular Space Mountain ride. Toontown: A cartoony land where all of Disney’s most famous characters from Mickey Mouse & Donald Duck to Goofy and Pluto come alive. Fantasyland: An area that brings to life Disney animated classics like Snow White, Cinderella, and Winnie the Pooh. Critter Country: Based on the film “Song of the South,” this land features the quirky Br’er animals (rabbit, fox, bear) and wet & wild Splash Mountain. Westernland: A nostalgic look at the wild western frontier of the United States featuring a river cruise. Adventureland: One of the most entertaining parts of the park puts you into the mindset for adventure and lets you explore a treehouse & pirate ship as well as float along in a jungle river cruise. 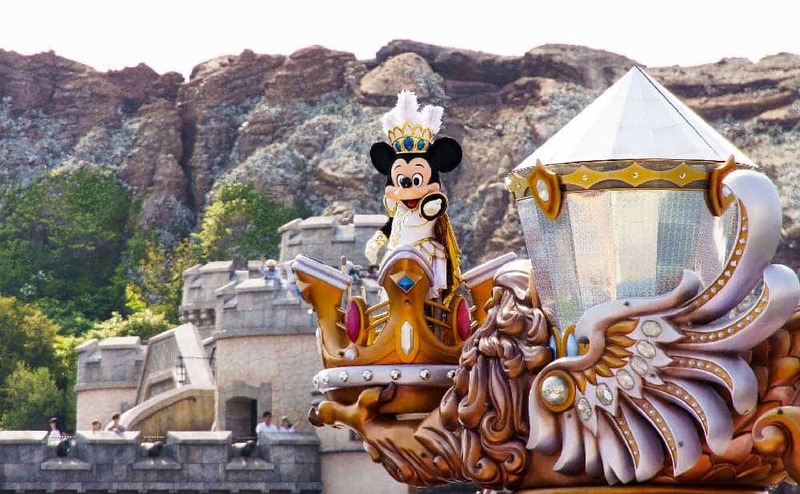 Besides spending time exploring Disneyland, don’t miss out on Tokyo DisneySea, the resort’s other fantasy theme park that cruises through seven unique ports: Mediterranean Harbor, Mysterious Island, Mermaid Lagoon, Arabian Coast, Lost River Delta, Port Discovery and the American Waterfront. If you don’t want to shell out hard-earned yen for sweeping views of the city, Tokyo Metropolitan Government Building is the best alternative. The free twin observation decks, peering out at the skyline from 202 metres, are the most budget-friendly option for massive vistas of the entire city. On clear days, you can expect to see as far as Mount Fuji with all of Tokyo’s most famous landmarks—Tokyo Tower, Tokyo Skytree, Meiji Jingu, and Shinjuku Goyen—emerging in the view. Both observatories are open year round (except from December 29th to January 3rd) from 9:30 to 23:00 (North Observatory) and 9:30 to 17:30 (South Observatory). The North Observatory closes the 2nd and 4th Monday of the month while the the South Observatory is closed the 1st and 3rd Tuesday of every month. Missing High Street shopping? Let Ginza fill the void! 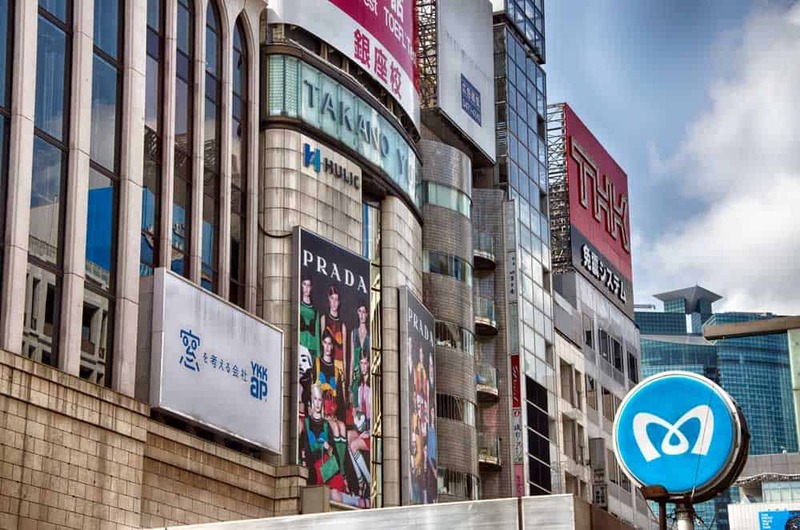 Ginza is Tokyo’s upscale shopping district where prestigious Japanese stores like Wako and Mitsukoshi vie along with many of the world’s most recognized international fashion brands—from Armani and Burberry to Chanel and Dior—to drain the wallets of the well-to-do. While shopping is among the top things to do in Ginza, budget-conscious travellers will still find joy. Like Shinjuku or Shibuya, walking around the streets of Ginza, ducking into side streets to uncover hidden restaurants and shops, is the quintessential modern Japanese urban experience. Find your way to Ginza on the weekends when Chuo-dori closes off to traffic for even more excitement. The so-called Pedestrians’ Paradise lures street performers and miscellaneous hawkers to create an enticing scene full of energy. Want to stay in Ginza? Check out the area’s best hotels with this guide to where to stay in Ginza! 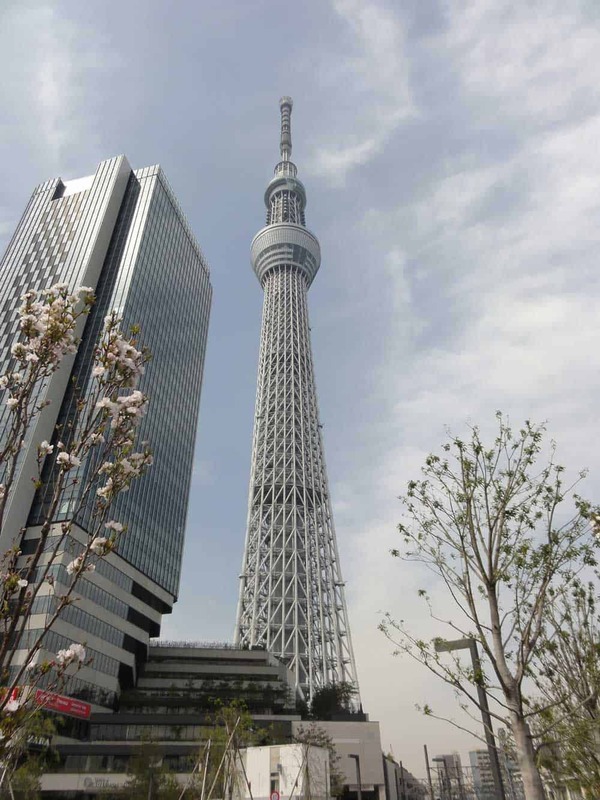 If you haven’t quite had your fill of Tokyo from above, set aside time to visit Tokyo Skytree in Sumida. This massive 634-metre tower holds title as the tallest structure in Japan—even taking second spot worldwide! The two observation decks hover at a whopping height of 350 and 450 metres. As you’d imagine, the 360-degree panorama from each is spectacular. Buy your tickets for the first observation deck on the 4th-floor (regular: ¥2,060; Fast Skytree: ¥3000). From the first observation deck, you can continue up to the second platform for an extra ¥1,030. Alternatively, purchase a Fast Skytree combo ticket for ¥4000 that gives express access for both. Seeking out the latest gadgets in Tokyo always starts with a stop in Akihabara. Tokyo’s famous electronics shopping district (also referred to as Electric Town) is the perfect place to browse through mobile phones, computers or cameras. Even if you don’t need the latest Nikon DSLR or iPhone, the main drag of Akihabara, Chuo-dori, is a colourful place to while away you day. As of late, the face of Akihabara has been changing, garnering fame for its grand expression of otaku culture. Specializing in all things Japanese pop culture—from anima and manga to video games and collectible goods—otaku shops have sprung up among the electronics vendors. Perhaps the weirdest development of the bunch for non-Japanese is the explosion of theme cafes in Akihabara. If you’ve ever fancied yourself a propertied well-to-do, grab a coffee or tea at a maid cafe like @home cafe or Cure Maid Cafe to get pampered by waitresses dressed as French maids. Other odd options include a cat cafe (Neko JaLaLa), owl cafe (AkibaFukurou), and the Cheese Hedgehog Cafe. Lovers of fine arts can’t afford to give Tokyo National Museum in Ueno Park a miss. As the oldest museum of its kind in Japan, it’s home to the biggest collection of Japanese artwork and antiquities in the world. Exploring the museum to its fullest takes the better part of a day. Highlights include the Honkan (Japanese Gallery), a collection of Japanese art spread over 24 exhibitions; Tōyōkan (Asian Gallery), showcasing art from elsewhere in Asia and the Middle East; and Hōryū-ji Hōmotsukan (The Gallery of Hōryū-ji Treasures), containing treasures dating as far back as the 7th century. Entrance to the museum is ¥600 for adults and free for children and seniors. It’s open from 9:30am to 5:00pm every day except Mondays (with extended hours on weekends during high seasons). Want the classic Japanese onsen experience without leaving the city? The Oedo Onsen Monogatari hot spring park in Odaiba is perhaps the best place in Japan’s capital to go for it! Opened in 2003, this hot spring theme park became an instant success. It’s designed to replicate the hot springs resorts and bath houses of the Edo era—and does quite a convincing job of it. Even if you’re not interested in stripping down to the—ahem!—bare essentials for a hot springs bath, the onsen offers less “intrusive” foot baths and an entertainment area in the courtyard with food stalls, a bar, souvenir shop, carnival games, and performers. One of the best parts about travelling around Japan is getting to experience the grace of a well-manicured Japanese garden. 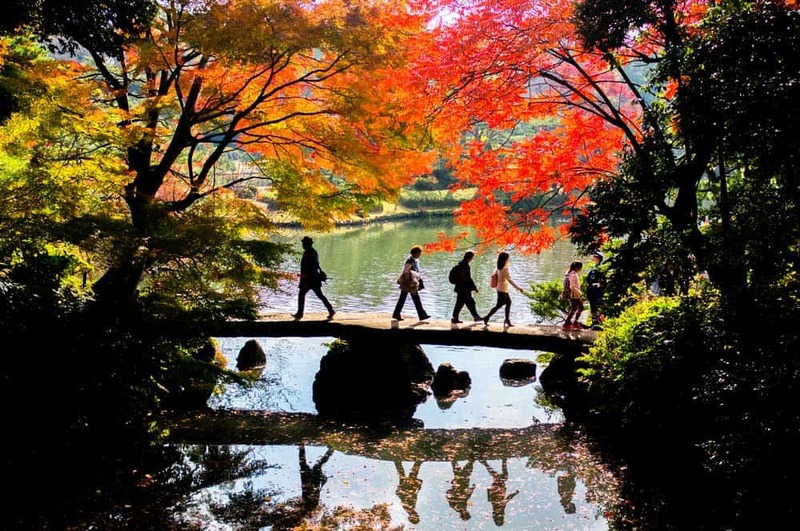 In Tokyo, there’s none more for visitors compelling than Rikugien Garden in the north of the city. These gardens, originating in the 18th century under the 5th Tokugawa Shogun, perfectly exemplifies the typical landscaping of the Edo Period. As you stroll through the paths that snake around a central pond and into deep foliage, you’ll watch as scenes from famous Japanese poems are re-created. Although the garden is absolutely lovely all-year-round, try to visit in autumn to witness its dense greenery erupt into a sea of colour. Red Planet Asakusa Tokyo: A contemporary 3-star hotel that’s just five minutes from the centre of Asakusa. The rooms are super clean and provide perhaps the best value among budget-friendly accommodations in the city. Hotel Rose Garden Shinjuku: A cozy no-frills hotel offering spacious rooms (by Japanese standards) in the buzzing Shinjuku area. Some of the top points of interest in Tokyo like Shinjuku Gyoen and the Metropolitan Government Building are within close walking distance. Mitsui Garden Hotel Ginza Premier: One of the top mid-range picks in the city, this elegant Ginza hotel capitalizes on Tokyo’s boastful skyline with impressive cityscape vistas from its rooms. Park Hyatt Tokyo: Among the best luxury hotels in Tokyo, this Shinjuku favourite unleashes 5-star service at its best. Whether you want to chill out with a massage at The Club or enjoying a nightcap with the skyline in full view at The Peak Bar, this splurge-worthy hotel isn’t one you’ll want to miss. 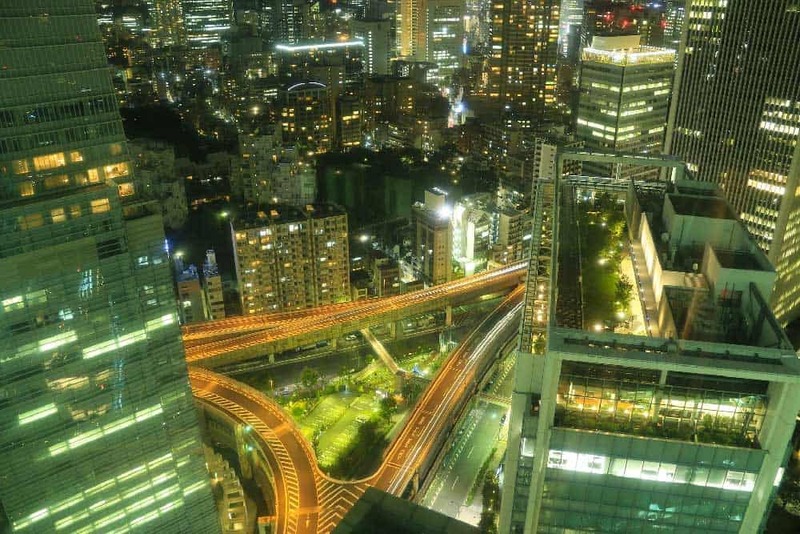 Want to gawk at Tokyo from above? Zip up to the free observation decks at the Metropolitan Building in Shinjuku or up the superlatively vertiginous Tokyo Skytree. Seeking an authentic Japanese food and drinking experience? 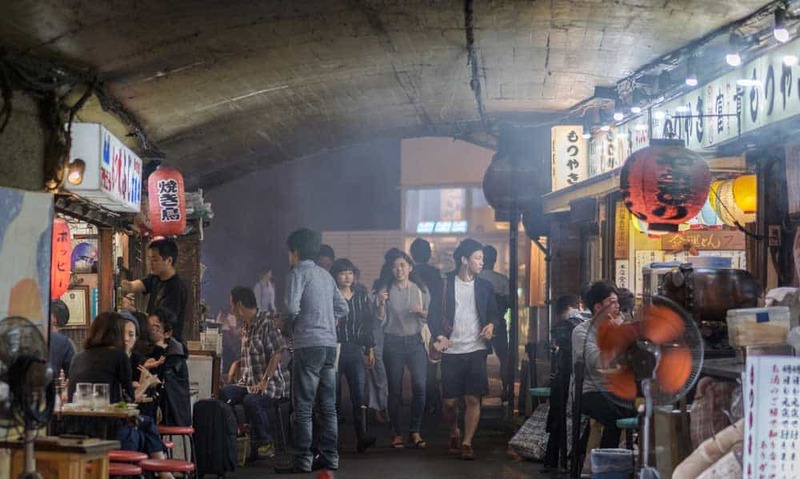 Eat and drink among locals in atmospheric Omoide Yokocho, Golden Gai, or Yurakucho. Need to fill your closet with the latest fashions? Peruse the boutiques of Ginza or add some edge with the youthful styles of Shibuya. Craving relaxation? Put your feet up among the cherry blossoms and gardens of Shinjuku Gyoen. Art lover? 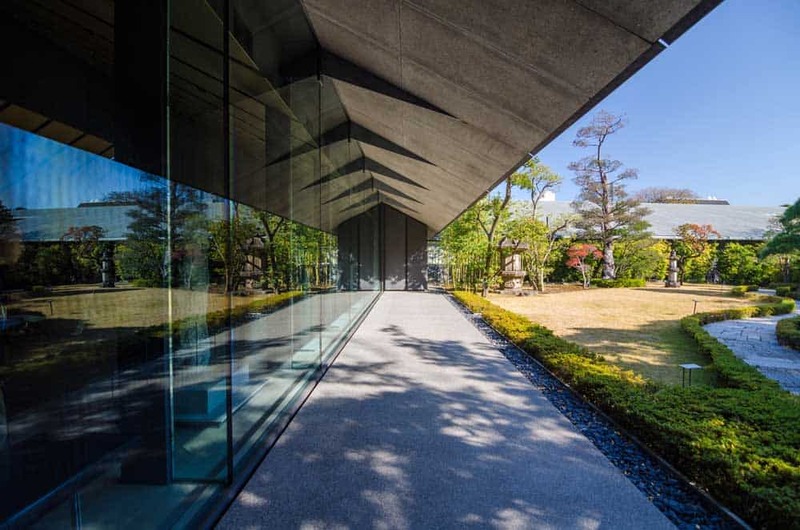 Don’t skip out on the Tokyo National Museum, the largest exhibition of Japanese art in the world, or the private collection (and garden) of the Nezu Museum in Aoyama.